Ibrox Noise: A massive selection dilemma for Old Firm? A massive selection dilemma for Old Firm? 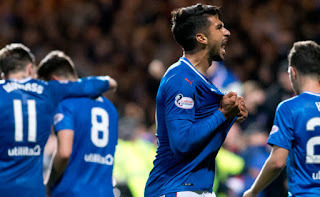 Few can deny Mexican Eduardo Herrera has not had the smoothest of starts to life at Ibrox. The ex-UNAM striker has had a reasonably solid career, if not a stunning one, and while his pre-season displays this summer showed great promise, his performances in the real stuff once the competitive season was underway in earnest seemed to go substantially backwards. Gone was the summer pressing, running, harrying and pace, and the Mexican international started to look a bit lost, losing his place in the process. His confidence appeared low, and he was starting to drift to the fringes of the first team. That all changed for the visit to Dingwall. While not a starter for that fixture, his cameo saw a fine goal, his first for Rangers, and it has set him on the road to settling in nicely. It was compounded by an even better one at Firhill, with, admittedly, a slight deflection, but the forward now had the confidence to try and he earned it coming off. He has now given manager Pedro Caixinha a selection dilemma for Saturday. While ‘red hot’ would be a bit of an exaggeration, the striker is certainly showing promise and signs of life, and one league goal is already more than the rested number 9, Kenny Miller, has scored domestically this season; the latter has two strikes – one in the Europa League, and one v Dunfermline in the Cup. Miller was famously rested for the trip to Maryhill, and one would assume he probably will line up on Saturday, but Herrera’s upturn in form has come at a very good time and the former Pumas striker is now starting to justify his manager’s faith in him. If Rangers were to select Herrera over Miller, it is unlikely too many fans would be upset. We know what Miller can do, and he would be a great option from the bench. But equally he will not let us down against Celtic and is always there for the big occasion. It is entirely possible Miller (midfield) and Herrera will both start, but personally we think that would not be ideal. Some might even pick Pena to slot in there. Who would you choose as your number 9 for the Old Firm? If we don't start something like this were truly fuked!! All need to be 100% mind!! Got to be Pena, The boy looks to have something about him and was unlucky with a few passes he tried the other night. He appears to have a good relationship with Morelas and offers more pace with direct running. He wont do so well in defence bu might get us up the park. The more worrying problem is the left hand side of the pitch. Hopefully John starts but he looks more like a winger IMO , suppose it needs to be windass assuming the formation stays the same. I am going have £100 on that are you. Morelos up front with pena playing just behind him. I reackon we probably need to start with Miller as he knows the script, gets important goals and never lacks effort in old firm games where hopefully his energy and commitment will be contagious and lift the level of rest of team, however at end of day the truth is that it is probably more about the tactics adopted by our, thus far, extremely underwhelming manager, last season he insisted on the diamond formation which left wide areas, like Sauchiehall Street at 3 in the morning, and we got leathered. My biggest concern is that Rodgers, while only having a half decent team at best, is very organised tactically where we, week in week out it appears, don't seem to have any mature or specific tactics at all with same size fits all approach no matter who the opposition is.